Mass (g) - The total mass (which may consist of one or more pieces) of the fall or find known to the Meteoritical Society Committee at the time of publication. Unless it is part of a large fall this is likely to be the mass of the stones(s) listed by the classifying laboratory and/or the individual who submitted it for classification. 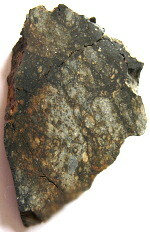 Meteorite dealers often refer to a related value as Total Known Weight or TKW (although what they actually refer to is Total Known Mass), this may be a higher mass than that listed in the Meteoritical Bulletin if more paired (see below) stones have been found since the original classification was published. S1: Unshocked. Sharp optical extinction of olivine. S2: Very weakly shocked. Undulatory extinction of olivine. S4: Moderately shocked. Mosaicism in olivine. S5: Strongly shocked. Isotropisation of plagioclase (maskelynite) and planar deformation features in olivine. S6: Very strongly shocked. Recrystallisation of olivine and phase transformations of olivine (ringwoodite and/or phases produced by dissociation reactions). The shock pressure of around 5 GPa will give a rating of S2. An S6 rating represents a shock pressure of greater than 50 GPa. Impact melts and impact melt breccias occur at 75-90 GPa. W0: No visible oxidation of metal or sulfide. A limonitic staining may be noticeable in transmitted light. W2: Moderate oxidation of metal, about 20-60% being affected. W3: Heavy oxidation of metal and troilite, 60-95% being replaced. W4: Complete (>95%) oxidation of metal and troilite. W5: Beginning alteration of mafic silicates, mainly along cracks. Mineralogy - The classification may refer to various minerals, elements and compounds, such as Fayalite, Enstatite (Ferrosilite), Iron, Nickel, Troilite and others depending on the type of stone and the classifiying laboratory. Usually you will see information such as the proportion of the stone composed of each constituent either as a percentage of the total volume (vol%), as a percentage of the total weight (wt%) or as a molar percentage (mol%). Type Spec Mass (g): - When a stone is classified, guidelines suggest that a minimum of 20g or 20% (whichever is smaller) must be submitted to the classifying laboratory. After publication this piece is retained by the classifying institution and becomes the type specimen. Info - Other information could include the name of the classifying institution and scientists. The owner of the main mass (this term describes the single largest piece of a particular fall or find in existance). Details of the fall itself. Details of the masses held in various institutions. Naming meteorites - Usually a meteorite's name will derive from a location close to where it fell or was found. The only exceptions are locations, such as the Earth's hot and cold deserts, where many finds, from a variety of falls, have been made. These multiple finds are each given the same location name along with a number to distinguish them. For example in Antarctica, the Thiel Mountains series of finds. Since the mid 1990's a great deal of meteorites have been found in the hot deserts of the world. This has produced a number of series including Sahara, Dhofar and North West Africa. North West Africa (NWA) is the most prolific of these and predominantly includes stones found in the deserts of Morocco and Algeria. Often these have been found by nomads and accurate individual find coordinates have not been recorded. Meteorites have been discovered in NWA at a rate far faster than laboratories can classify them, you will therefore see meteorites described as unclassified NWA. Most unclassified NWA meteorites are likely to be ordinary chondrites (LL, L or H type) since these are more commonly found and anything unusual will have been spotted by meteorite dealers in Morocco or elsewhere. Pairing - In NWA (and elsewhere) it is possible for stones which originated in the same fall to become separated from each other unintentionally (or in some cases intentionally). The deserts have preserved many thousands of falls over several thousand years, their strewnfields are likely to overlap and the recovery/sales process may result in an amount of 'mixing'. This can result in a single meteorite fall being classified multiple times and represented by several NWA numbers. These individual classifications are described as paired. Meteorite dealers sometimes sell stones as 'likely paired', which means that they are visually indistinguishable from another classified stone, but this has not been confirmed by a laboratory analysis.